Dark near red and orange colored perfectly formed buds open to nicely fragrant apricot colored flowers that mature to a nice medium to coral pink and that are almost full enough to resemble a cabbage rose. Flowering is heaviest in spring and fall and well-established plants will produce additional flowers in between times. Cornelia is an heirloom Hybrid Musk Rose with good disease resistance and it is nearly thornless making it a good choice for arbors and near garden paths. 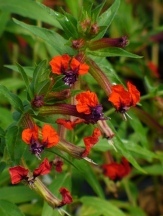 It can be grown as a large fountaining shrub or as a medium-sized climber with canes can that reach 10'. 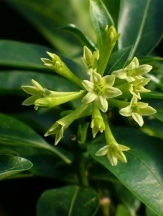 Provide a full to mostly sunny location, although Cornelia is considered to be moderately shade tolerant, in an average moist moderately fertile soil with average or better drainage for optimum vigor and flowering. An RHS Award of Garden Merit winner. Soil & Moisture: Average moist, moderately fertile, average to well-drained soils. 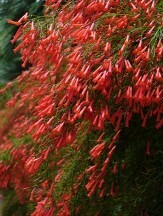 Flowering Period: Spring and fall with some flowering on well-established plants in between. Fertilizing: Late winter or early spring until about midsummer. Pruning: Prune out old unproductive, diseased, or damaged stems in late winter if needed. When to Plant: Fall, winter, and spring and keep an eye on moisture when planting in summer. Deer Resistance: Frequently Damaged Deer resistance is relative to how hungry the deer (or other herbivores) are, what food is readily available in their natural habitat, and how tasty a particular plant is. Few plants are truly completely 100% resistant to being browsed by hungry deer and other herbivores. Please realize that this is just a guide based on our experience and research but some plants may never ever be bothered. Dormant Shipping: May be winter deciduous but usually has at least some foliage.